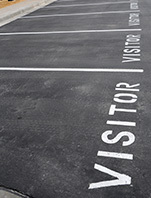 All businesses benefit from a presentable and professional approach to their premises. Our specialist rotating whirlaway cleaner will remove grime and dirt from all types of driveways, car parks and forecourts, leaving them clean and oil-free. Ideal for cleaning flat surfaces, our pressure wash cleaning service will eliminate any weeds, moss or grass and much more. Request Grevitt’s Specialist Cleaning Services to clean your paving or car park and restore it to its former glory at a mere fraction of the installation cost. Your clients will be impressed and so will you.